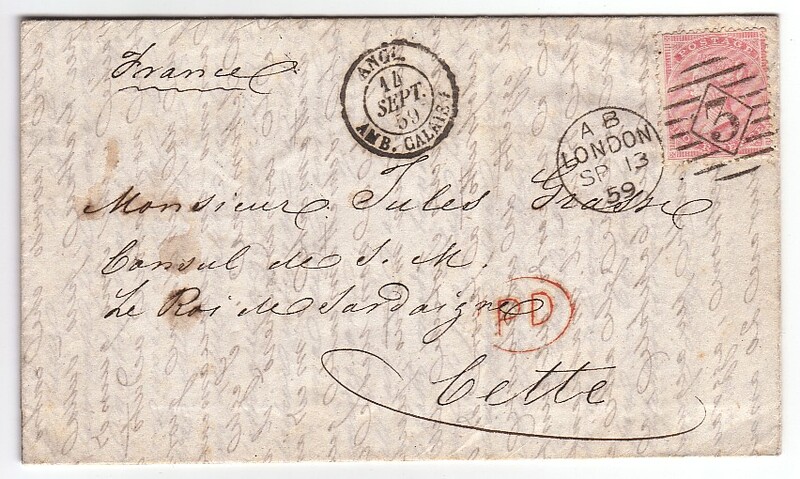 tied to a piece by a fine strike of the very first duplex '73' cancellation which was initially introduced in London, February 24th 1853. Only one example of this first day of usage is known on full cover. It first appeared on the market in a 2006 Spinks sale and realised a figure of £2,470 inclusive of the Buyers Premium. 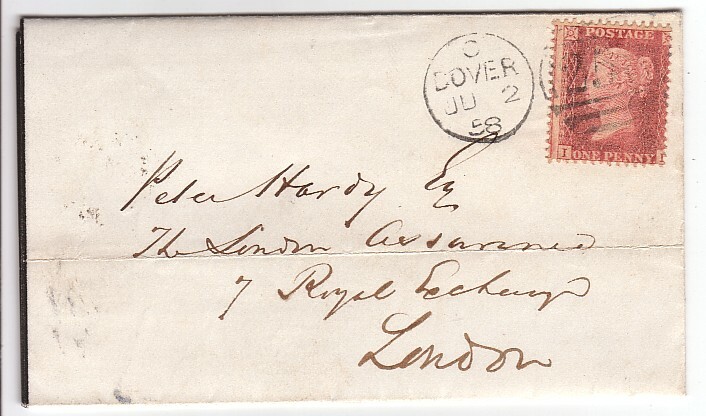 This cover has the London 73 duplex on a 3-margined 1d red, 'AJ', cut well in to at the right and only a partial strike of the ‘FE’ date. The example offered here has a totally clear date and also the same code 4 as the cover. of this historic cancellation used on its first day of usage. The development of the London duplex was the forerunner of this type of canceller used not only within the UK but globally. An important Exhibition item of historic significance in the development of cancellations. Pearson Hill Trial: very rare Morning Duty usage. 15125. 1d SG40 tied to piece by the Pearson Hill second trial, February 9th 1858.
is considerably rarer than Code ‘A’ the afternoon duty. Only TWO full covers are known with Code ‘M’ and this is the first example we have been able to offer. Used on February 9th 1858, this is the penultimate day of the trial period. Pearson Hill Trial: rare usage on a 2d value. 2011 Edition and one of only two double letter varieties on this plate. December 23rd 1857, Code ‘A’ for afternoon duty. This trial cancellation is very rarely found on other than the contemporary 1d value. including usage of the dater as a backstamp. All are from an Award-Winning display. 152212. 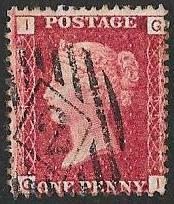 2d SG35 plate 6 very fine used with part red cancellation. 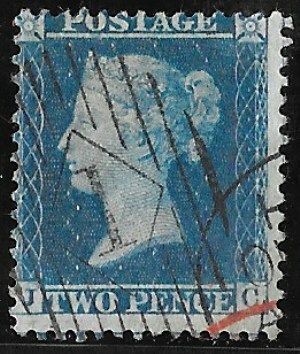 A rare usage of the Number 1 Machine (7bars) on this stamp. tied to a clean and uncreased legal entire to Wymondham by the First Machine. Code HS with 7 bars at the top and bottom ie 2.7.7.2 bars, for December 17th 1858. 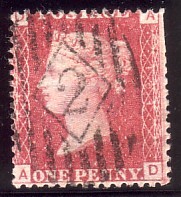 The stamp is tied by an additional partial second strike. in excess of £200 before allowing for the cancellation. covers with a usage of these machines on values other than the contemporary 1d are rarely found. NB: the condition of the front of the entire is finer than in the scan. Code HS with 7 bars at the top and bottom ie 2.7.7.2 bars, for July 7th 1859. 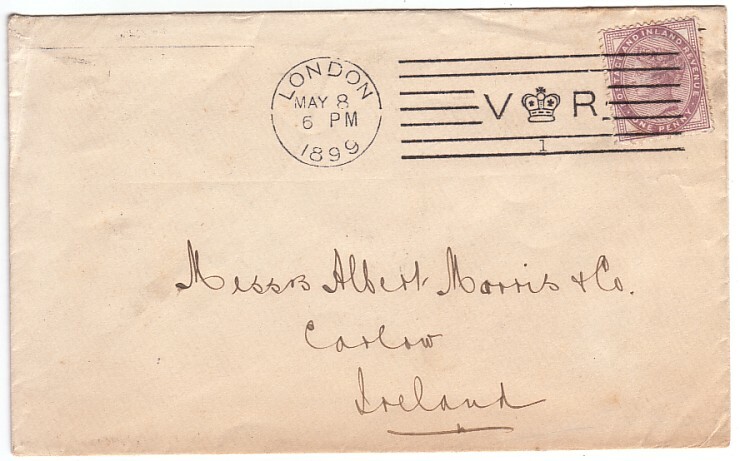 The finest strike we have seen and especially rare as such on a postal stationery envelope. for August 27th 1859, with 7 bars at the top and bottom ie 2.7.7.2 bars. The code HS has the 'S' INVERTED: an UNRECORDED variety by Parmenter with this set of bars. With the 2.8.7.2 bar arrangement he notes only one example inverted ie for July 16th 1858.
a SUNDAY, which displays well when raised. 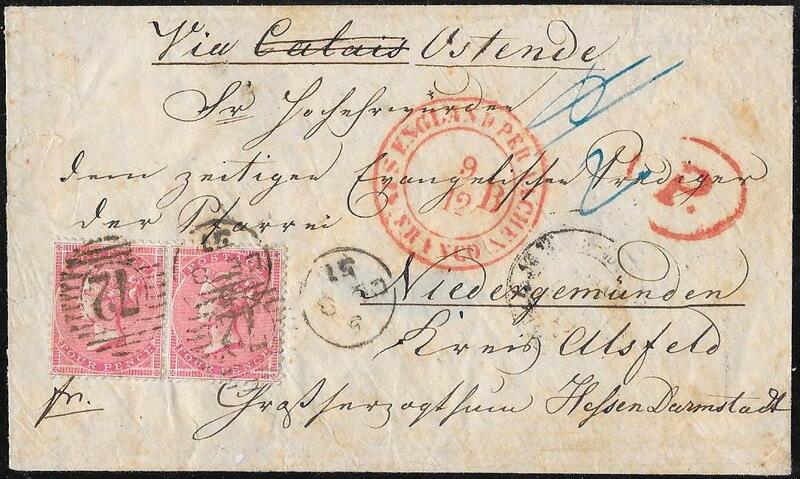 for September 10th 1859 with 7 bars at the top and bottom ie 2.7.7.2 bars. The code HS has the S INVERTED: an UNRECORDED variety by Parmenter with this set of bars. 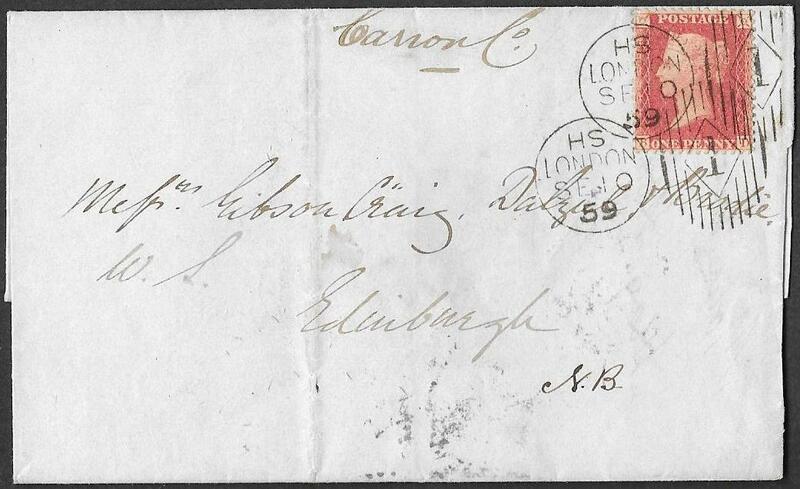 On the reverse is a fine/very fine strike of an Edinburgh TPO for September 11th 1859 - a rare SUNDAY usage. This TPO strike is recorded in use by Wilson from July 25th 1859 to May 28th 1862. Hence the example offered here is a usage within its first two moths. 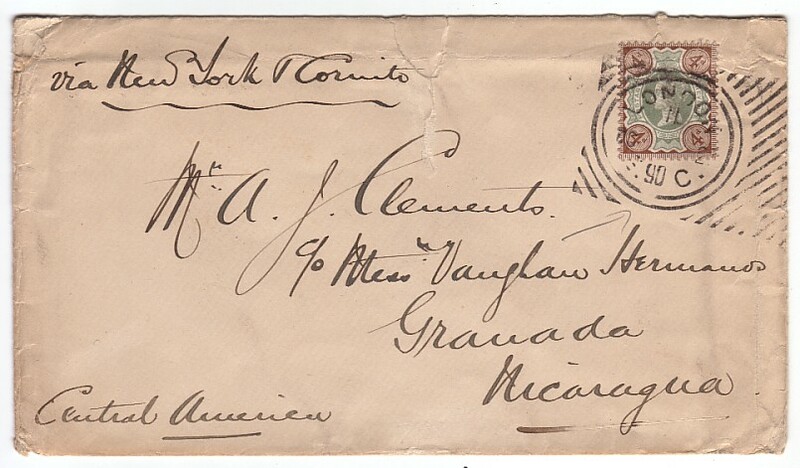 for January 8th 1859 with 7 bars at the top and bottom ie 2.7.7.2 bars. A rare and attactive item. NB: this item and 152066 are the only double strikes with the inverted S we have seen. From the date, April 16th 1859, this has seven bars at the top: recorded in use from Oct 22nd 1858 to Dec1859. is the only known reversed code on any surface printed value. NB: the Number 1 Machine, with 8 bars at the top is known used with the 'SH' code but only on April 21st 1858.
with 7 bars at the top and bottom: the normal 'HS' code recorded in use from October 22nd 1858 to December 1859. Previously the only other date recorded for the 'SH' code was April 16th 1859 - see item 152051 above. This is an UNRECORDED date of usage for this extremely rare code. 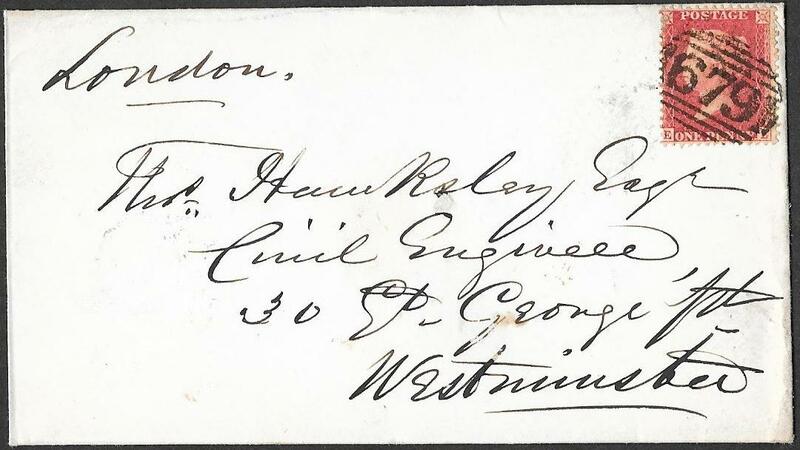 CHARLES RIDEOUT TRIAL machine number 2, with codes ‘CR’, April 15th 1859. Lambs-Conduit St udc on top flap. Very hard to find this quality of strike on such a neat cover. Rideout First Trial Machine Number Two with Code 'CR'. Rideout Machine: Rare LATER TRIAL 1866.
the Number 2 Machine was trialled sporadically between October 23rd 1866 and July 10th 1867. Examples from this trial are therefore rare. A very fine strike of this rarity and in fine overall condition. carried out in 1866 and 1867. Examples from this later trial are rare. cancelled by the later trial of the Rideout Number 2 Experimental Machine. with this watermark variety and cancellation. 152068. 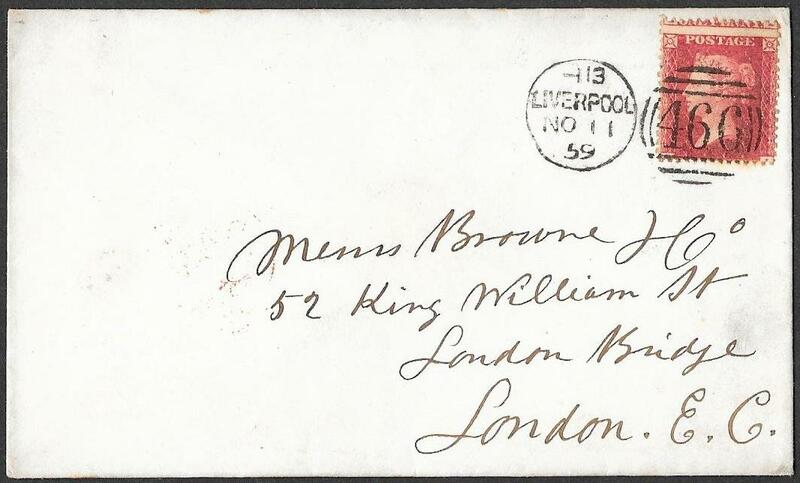 1d SG40, cancelled by 882 numeral of Wimborne, on a neat and clean envelope to London, August 4th 1858. 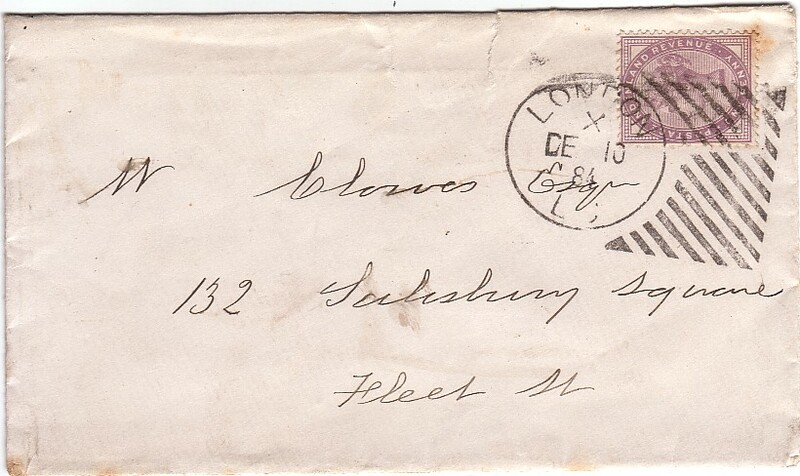 On the reverse is a very fine receiver strike for August 5th 1858 of the dater die from the First Machine Trial. Scarce and particularly in such overall fine condition. 152069. 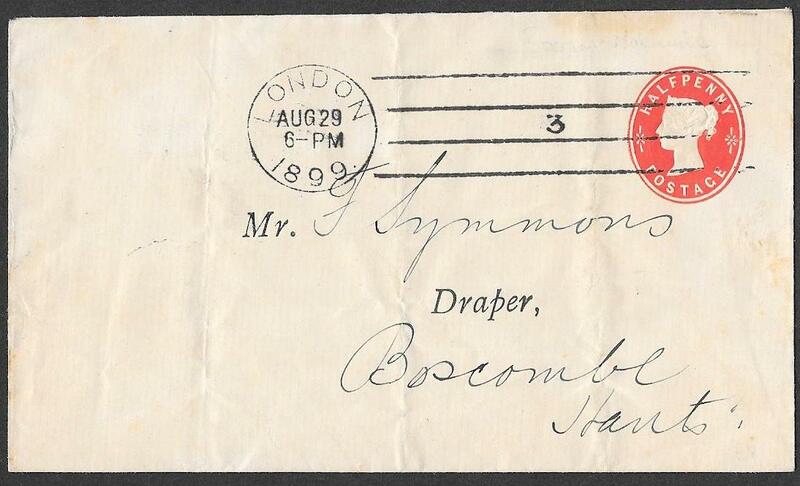 1d SG40, fine on a clean entire from St Helens, Lancashire and tied by its 679 numeral, July 30th 1858. This date extends the period of usage as recorded by Parmenter. 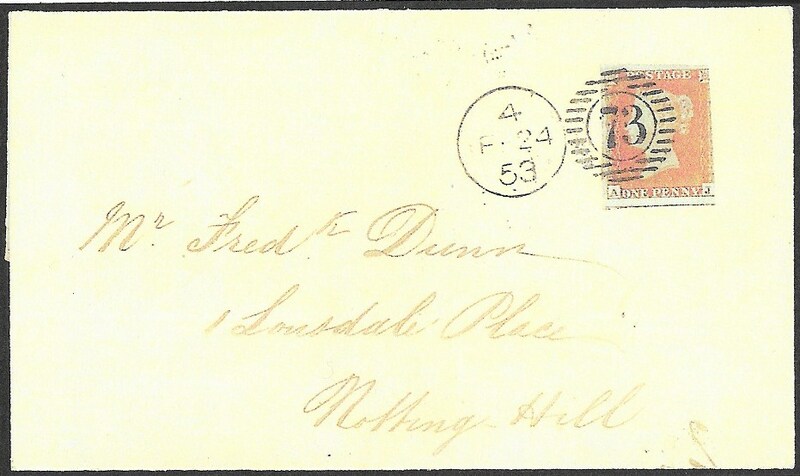 On the reverse is a receiving cds: the dater die from the First Trial. 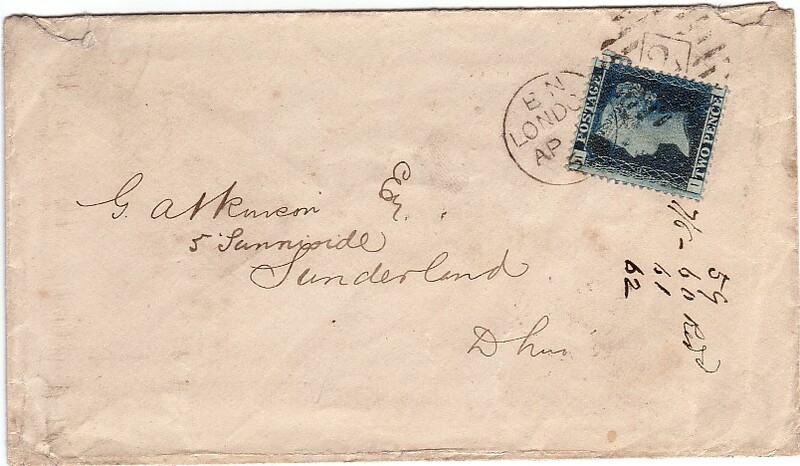 The code HS has the S INVERTED, unrecorded by Parmenter, and as such is very scarce/rare. we have seen with this inverted code letter. 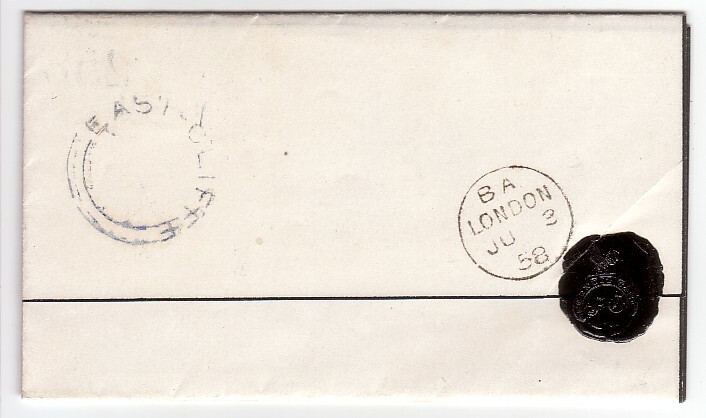 to a clean and neat envelope with a White-Cross Place undated double arc. 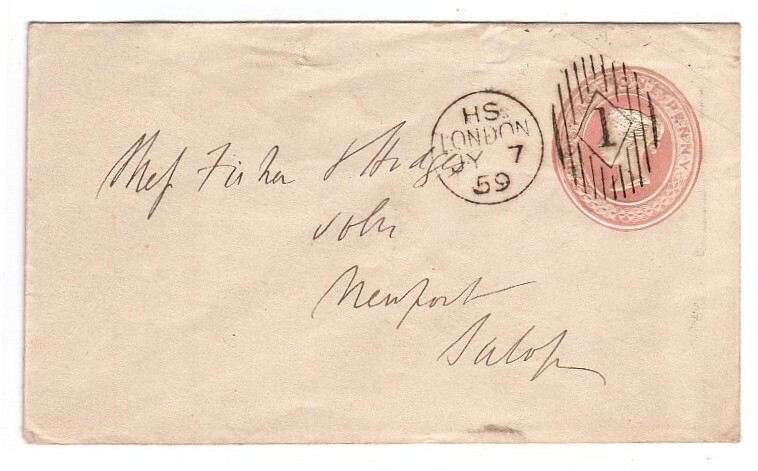 On receipt in London, the envelope received a very fine strike of the dater die, from the First Trial. This, and the previous item, are the only ones we have seen with the S inverted. 152072. 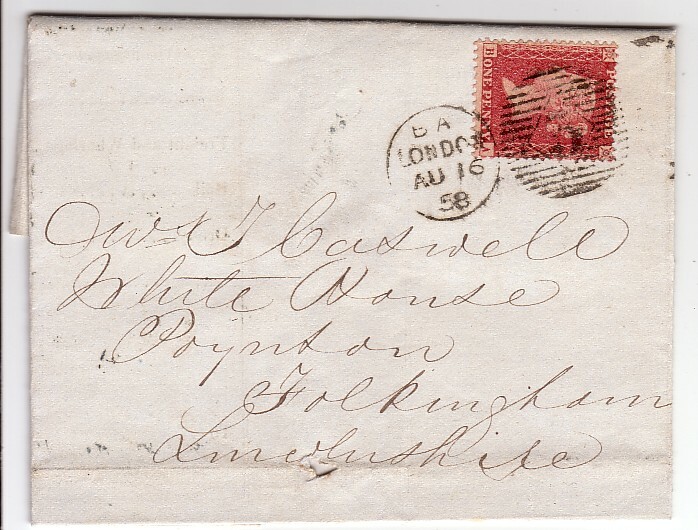 1d SG40, rounded NE corner, on a clean wrapper from Darlington July 5th 1859. 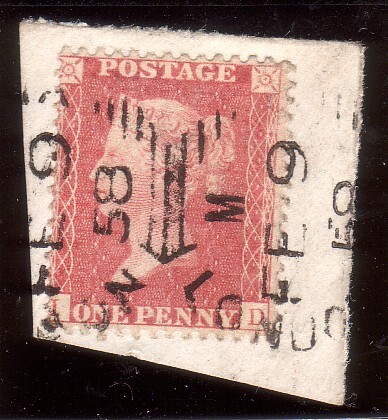 On reverse is a very fine DOUBLE strike of the dater die from the First Trial. This is the ONLY example of a double strike of the dater die as a receiver that we have seen from any of the Rideout trials. 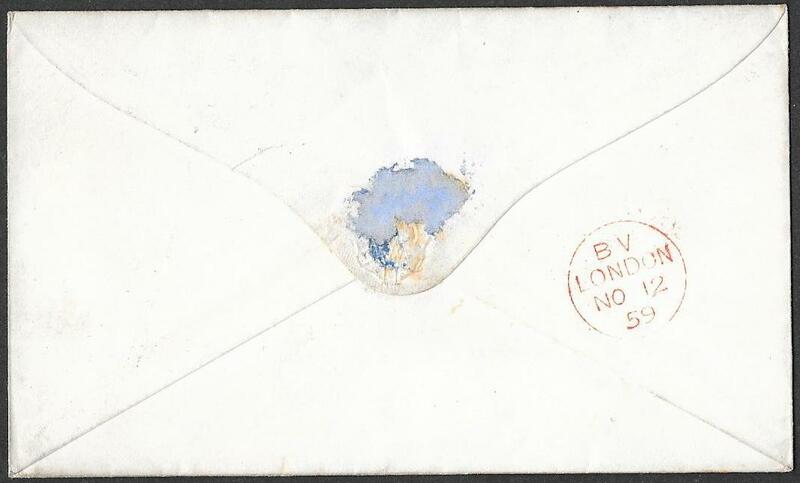 NB: the browning at the top left front of the envelope is paler than in the scan. 152071. 1d SG40, perf faults at the top, on a clean and neat envelope to Worcester. On the reverse is a very fine strike of the dater die from the First Machine, April 14th 1858, struck in BLACK. we are aware of only one other example in black for March 6th 1858. 152073. 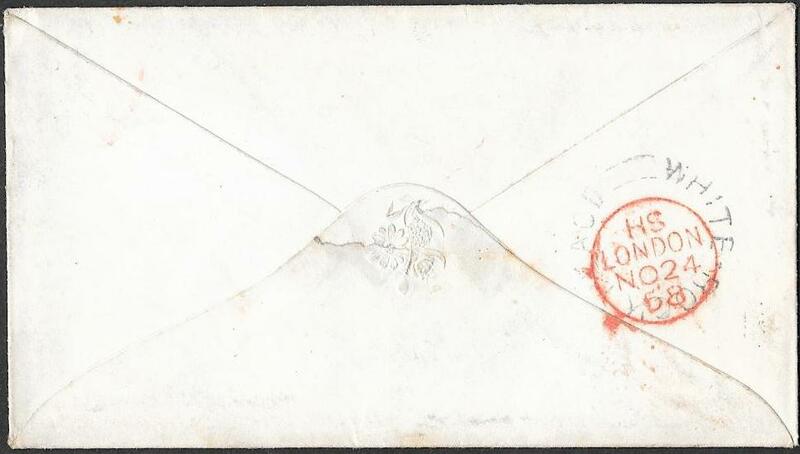 A fine1d SG40 on an envelope from Brighton to Colchester, fault at the top. 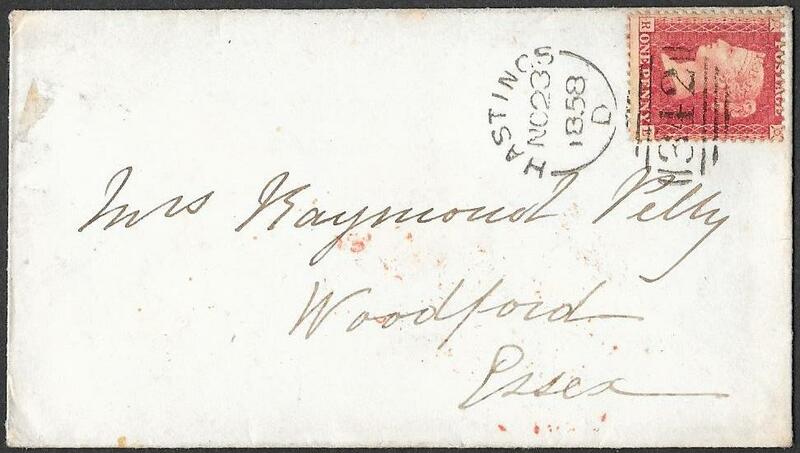 Stamp tied by a very fine Brighton sideways duplex for November 21st 1859. On the reverse is a superb strike of the dater from the Second Machine, Codes CR, for the following day. The second machine is recorded in use to December 3rd 1859 so the dater used here is close to the end of its usage. From our researches we cannot find a later usage of this backstamp in the First Trial period. Dater die from the Later Trial in 1866 and 1867. 152074. 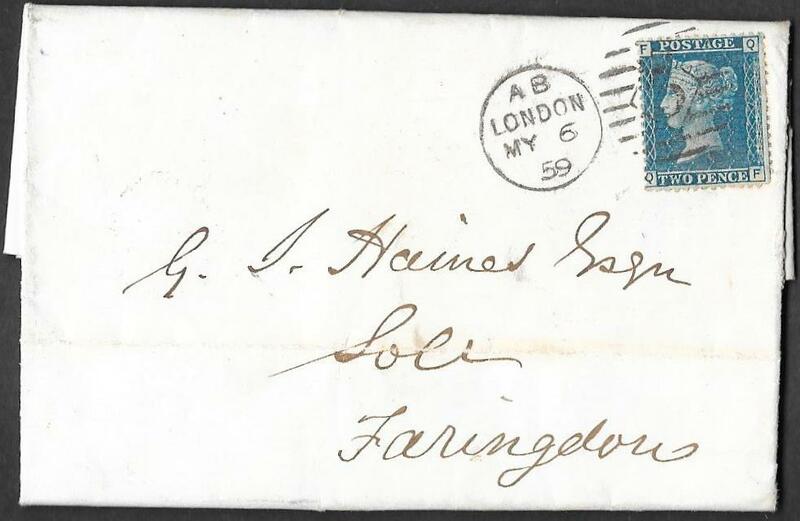 Fine 1d SG40 tied to a clean wrapper to London by a Salisbury duplex for March 8th 1867. 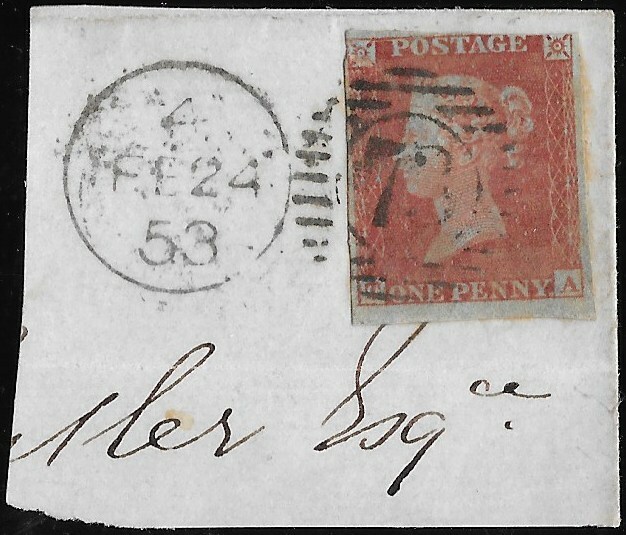 On the reverse is a superb strike of the dater die from the later Machine Number Two trial, March 9th 1867. This is the earliest usage we have seen of this backstamp. 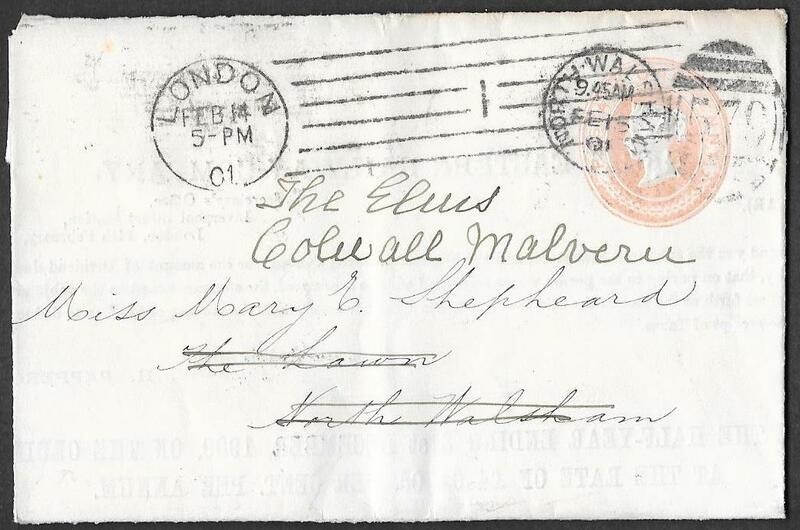 NB: the Salisbury duplex and the backstamp show the two abbreviations of March ie MR and MA respectively. 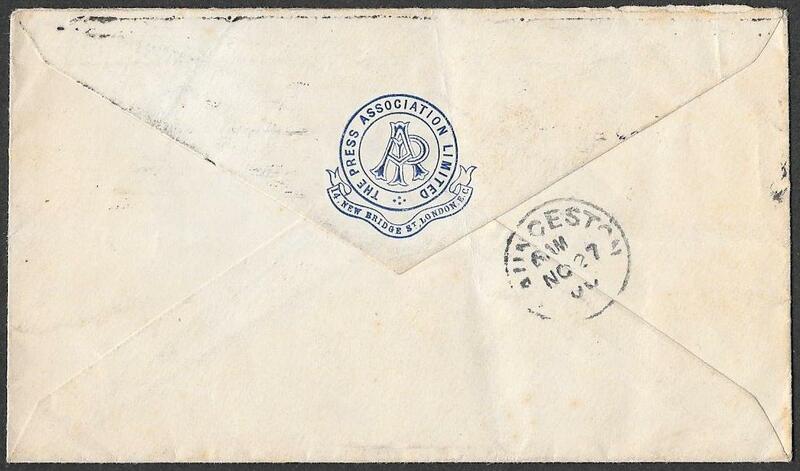 ‘Early Experimental and Inland Branch Duplex Cancellations’ by Parmenter et al. Duplex Machine Cancellation with number 3 in a diamond. 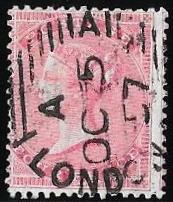 a unique TRIO of items showing usage and varieties of this rare/very scarce duplex with codes ‘BA’. a. 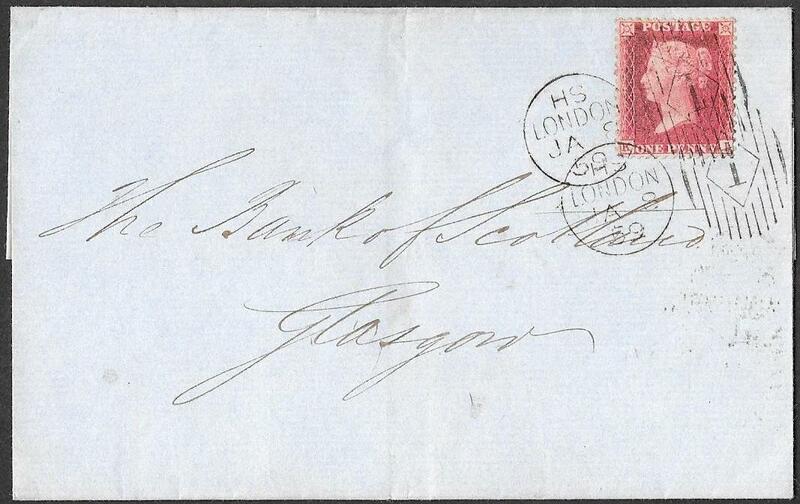 Printed Invoice to Folkingham, 1d star tied by a fine strike of this cancellation for August 16th 1858. 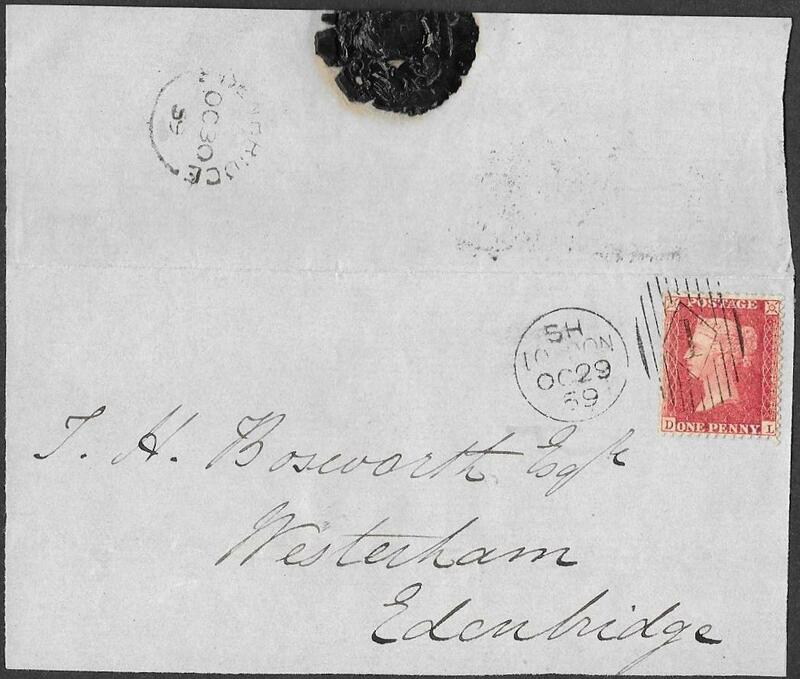 Cliffe udc and as a receiver, a superb strike of the dater part of 3PHT for June 2nd 1858 IN BLACK. This is an UNRECORDED usage of this dater cds and especially rare used in black rather than red ink. 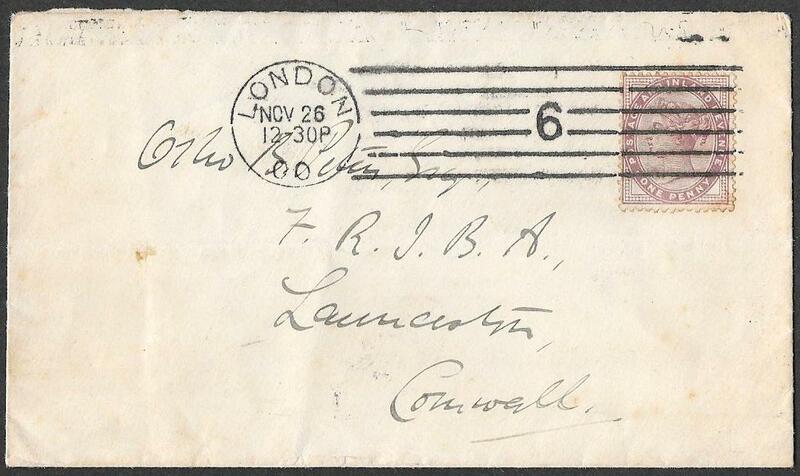 c. Wrapper to Kendal with 1d star tied by this 3PHT cancellation but with the code ‘A’ in ‘BA’ missing. The example here has the code letter ‘A’ missing on June 21st 1858.
so it went missing between June 2nd and June 24th 1858. An exceptional grouping that would make a memorable display page. 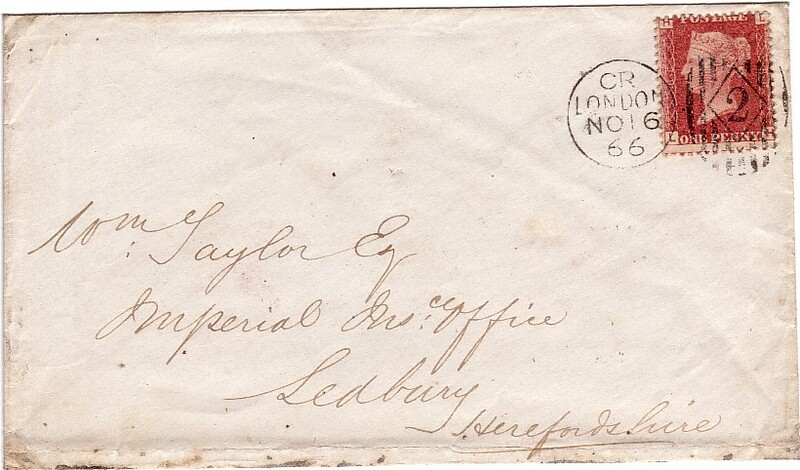 superb strike for May 4th 1859 on a clean and un-creased envelope to Stroud. arguably one of the finest extant of this rare trial cancellation. 152049. 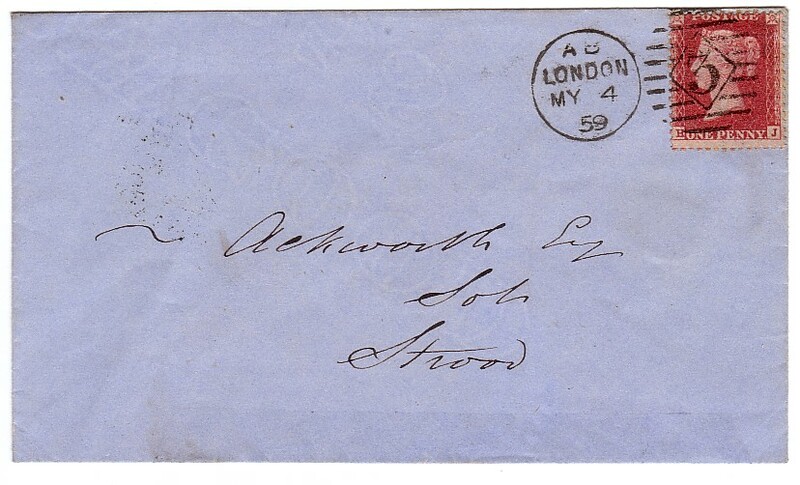 3PHT 5 Number 3 Die A Codes 'AB': recorded used March 25th 1859 to May 20th 1859. 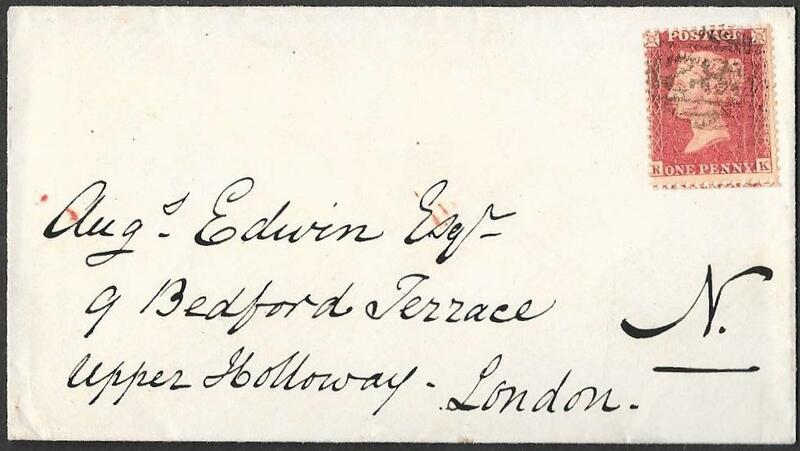 Very fine strike on a clean entire to Farringdon, MAY 6th 1859. A rare type as in use for less than 2 months. here it is seen on a 2d SG 45 and from the scarcer Plate 7. 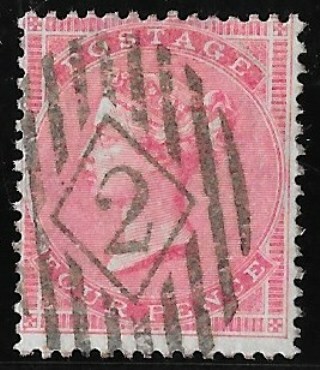 A very rare combination of cancellation and stamp. 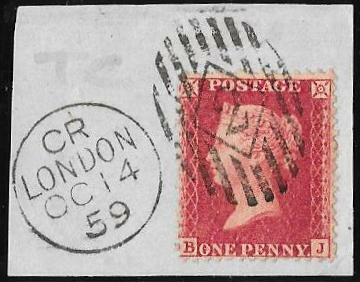 NB: In this early Die, the LONDON is narrow at 14.5mm which was replaced by a wider 16mm in 3PHT 6. 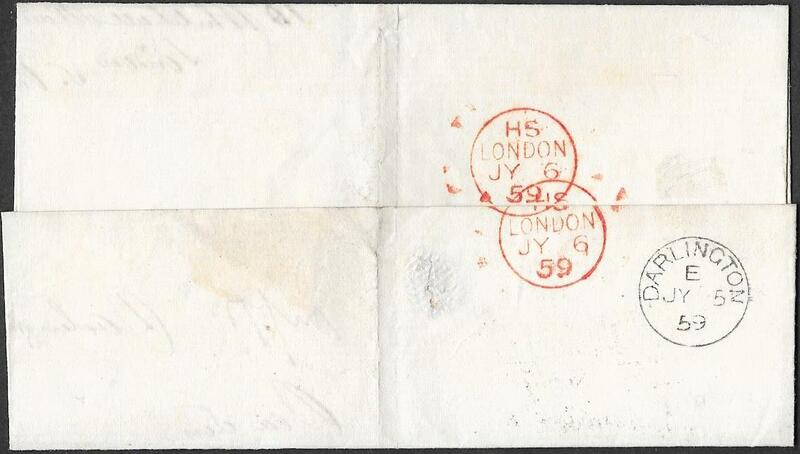 3PHT 6 Number 3 Die A has a wider,16mm, LONDON than in previous trials. Recorded by Parmenter in use from May 12th 1859 to 19th December 1859. His EKD is not illustrated and the earliest used date we can find is for MAY 13th 1859. Remarkably our EKD has been found on two overseas destination mail and these are offered here. 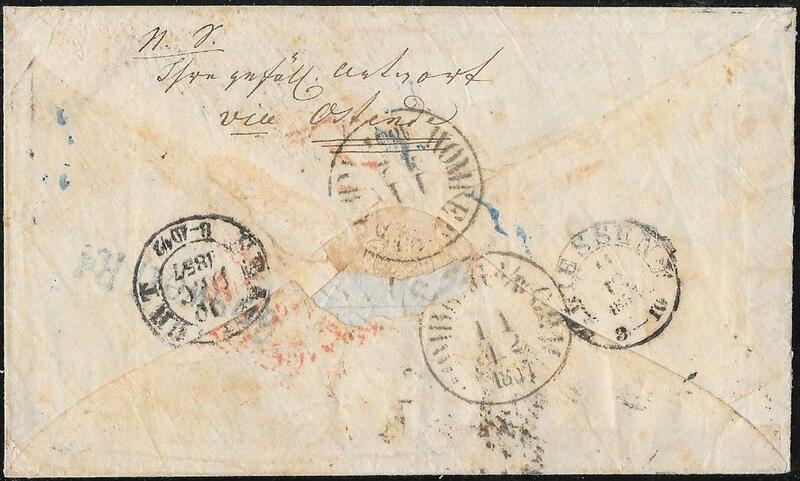 EKD known overseas usage of 3PHT 6.
two with faults, but used on MAY 13th 1858 and cancelled by FOUR strikes of 3PHT 6.
and the ONLY example with multiple strikes of this very scarce/rare cancellation. The EKD known overseas usage of 3PHT 6. 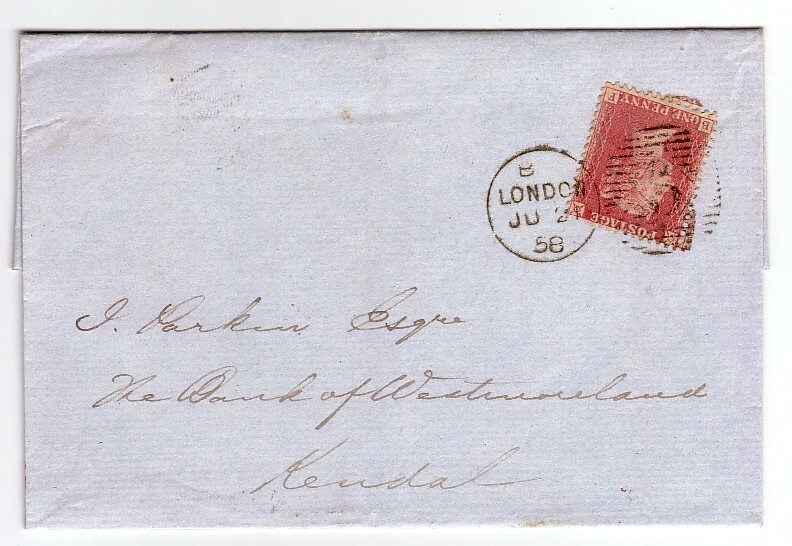 – marginal with the inscriptional folded over the top of the envelope. A few bluntish perfs on the wing margin but tied by a very fine/fine strike for MAY 13th 1859 of 3PHT 6. 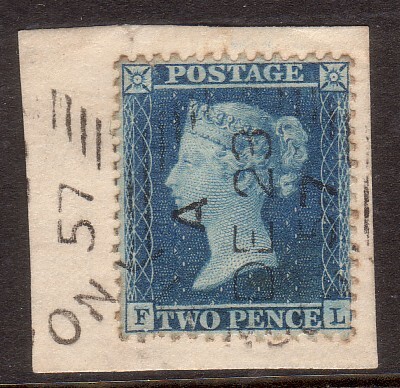 Extremely rare item and possibly a unique combination of cancellation and stamp. 3 PHT 6: Rare usage on 4d SG66 going overseas. 1306. 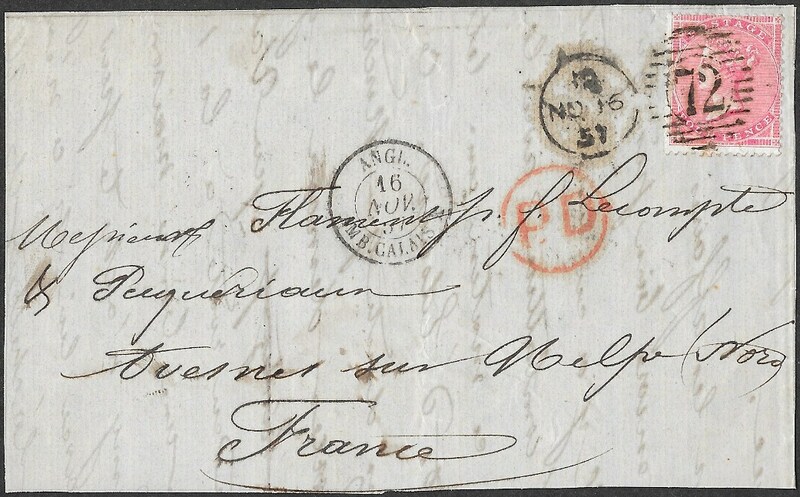 Entire written in French, to France with a 4d pale rose, SG66. Tied by an exceptional strike of 3PHT 6 for September 13th 1859.
and especially so in such overall fine condition. 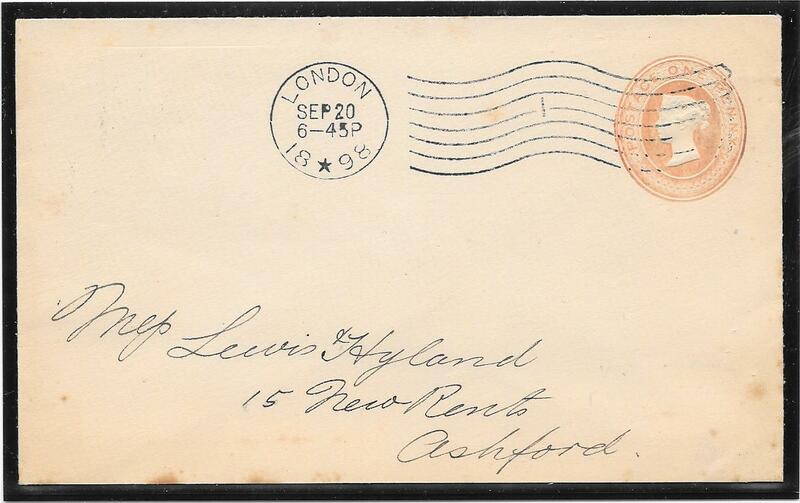 a very clean and uncreased envelope from Liverpool to London, fine missperfed 1d SG40. 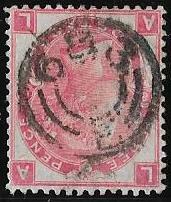 This is the first example we have seen of this dater used as a back stamp. the only example we can recall with a contemporary surface printed value. Rare usage on 4d SG66 going overseas. 1306. 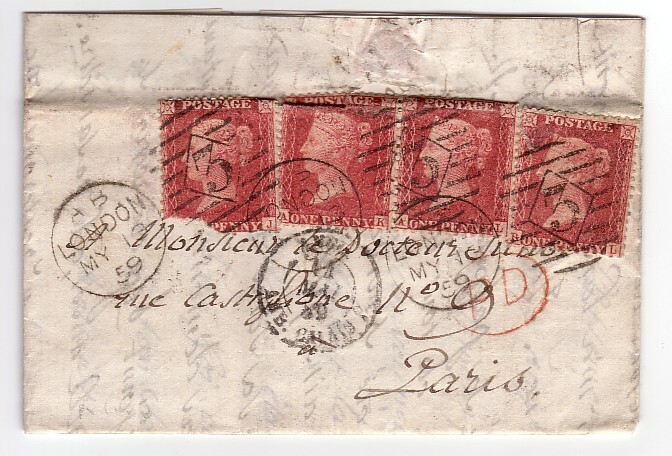 Entire written in French, to France with a fine 4d pale rose, SG66. the second Azemaar machine trial, October 27th 1871. Small Edinburgh receiving cds on the rear top flap for the following day. Bickerdike Machine Number 1: superb early strike. superb strike for May 6th 1899, within the first two weeks of usage. 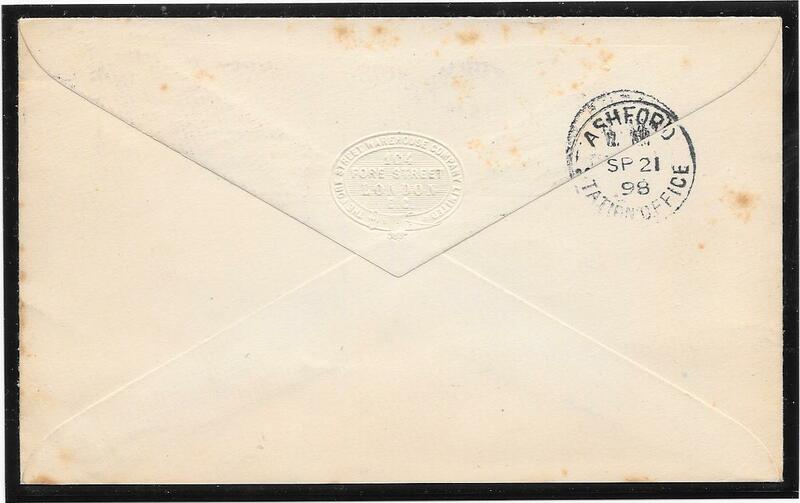 Clean envelope except for a vertical crease clear of the cancellation. 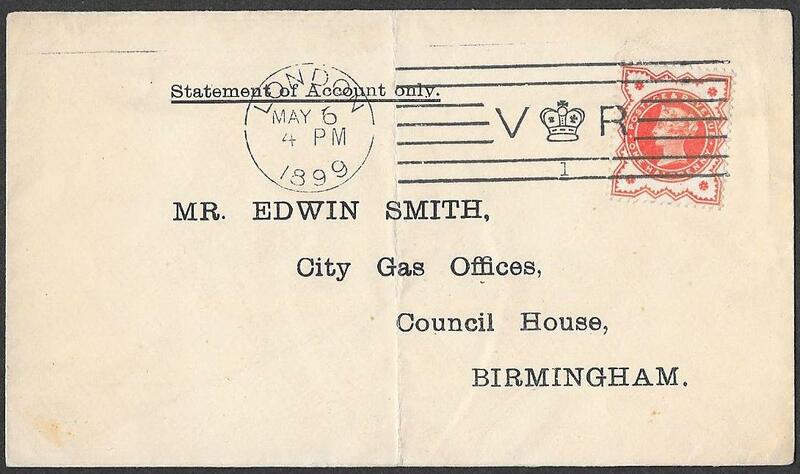 The envelope is embossed on the reverse 'City of Birmingham Gas Department. 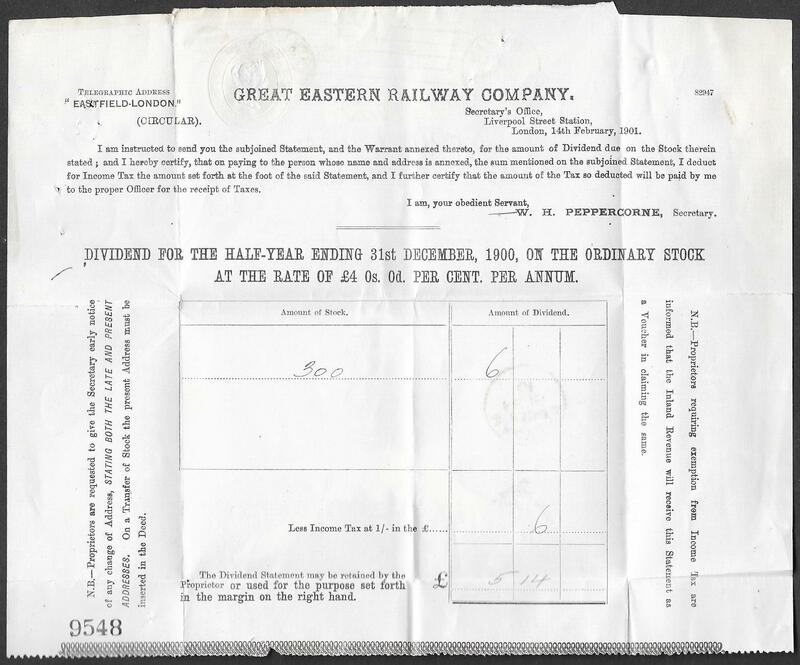 on 1d embossed printed Great Eastern Railway Company dividend statement. and a Malvern cds on the reverse. 151613. Boston Machine Number 3: very fine/superb strike, August 29th 1899.
and an early usage for this machine. 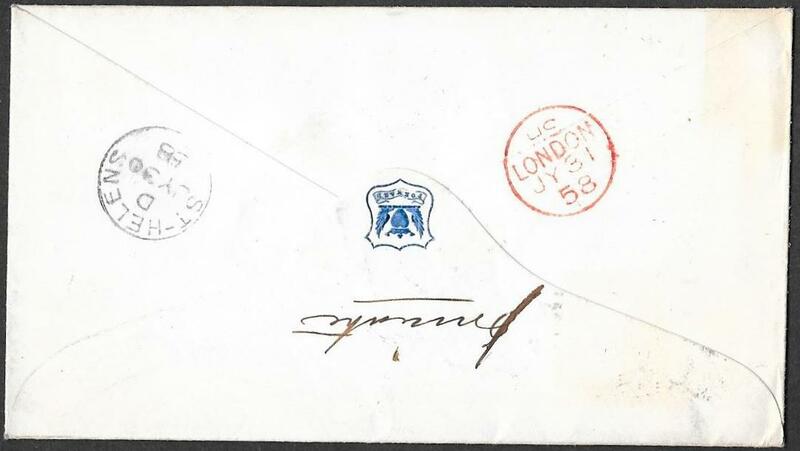 very fine strike on a clean envelope to Lewes, Sussex. A scarce 1899 usage for this machine at November 14th 1899. Some damage to the reverse top flap. 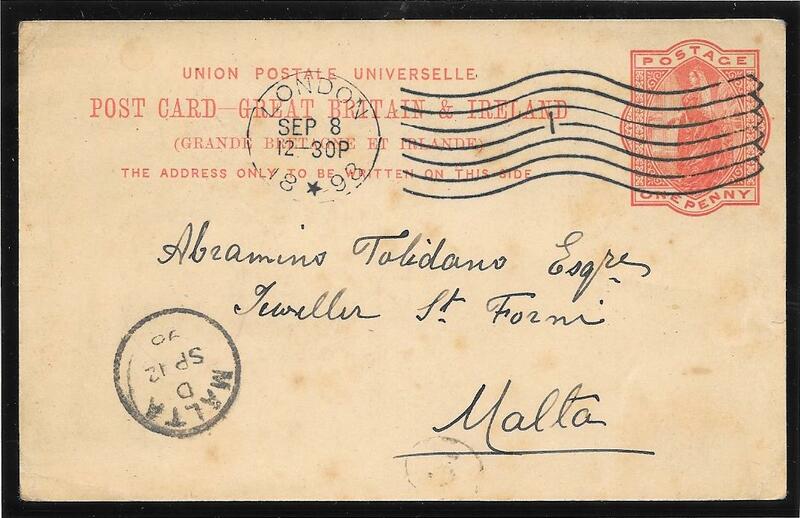 superb strike on a very fine UPU 1d postcard to Westphalia. An early usage of this machine at August 10th 1899. We cannot recall seeing the Number 5 machine used on this type of postcard. 151610. Boston machine Number 6: superb strike on envelope to Swansea. An early example of this machine at September 21st 1899.
a large sum of money in 1899. 151612. 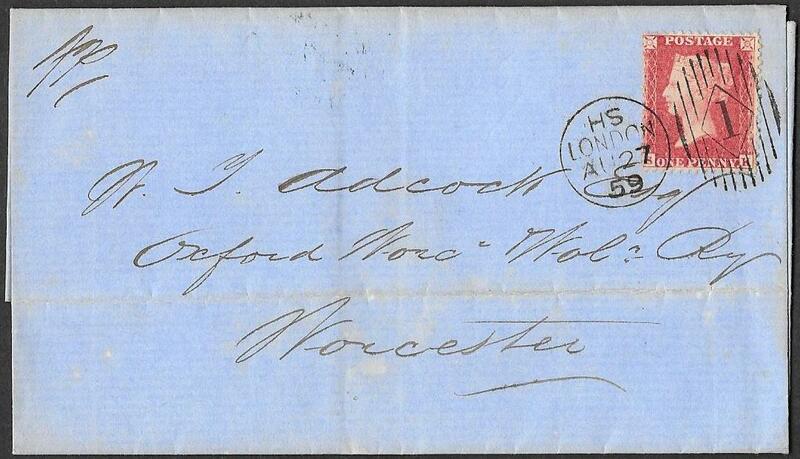 Boston Number 6 Machine: superb strike on envelope to Launceston, Cornwall. The dater has the year reduced to two numbers from the full year, November 26th 1900. On reverse a very fine Press Association Limited logo. 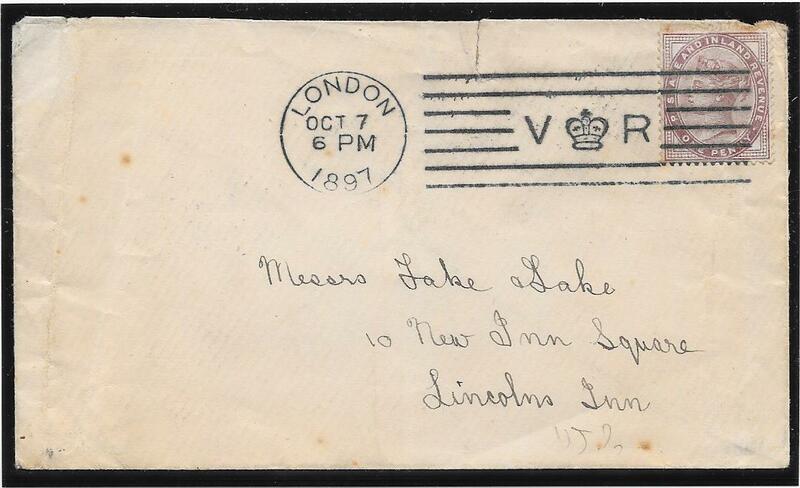 a superb strike on a clean piece with 1d lilac, October 4th 1897.
the previous EKD was October 5th 1897. Very little mail from this trial has survived. NB: the apparent browning on the piece is a trick of the scanner. 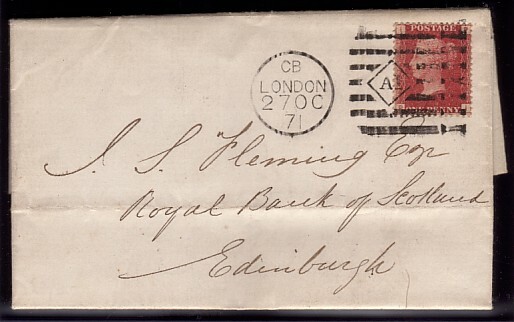 on an envelope used locally in London, October 7th 1897.
where there is a partial offset of the cancellation. Very little mail was used or has survived from these trial machines. 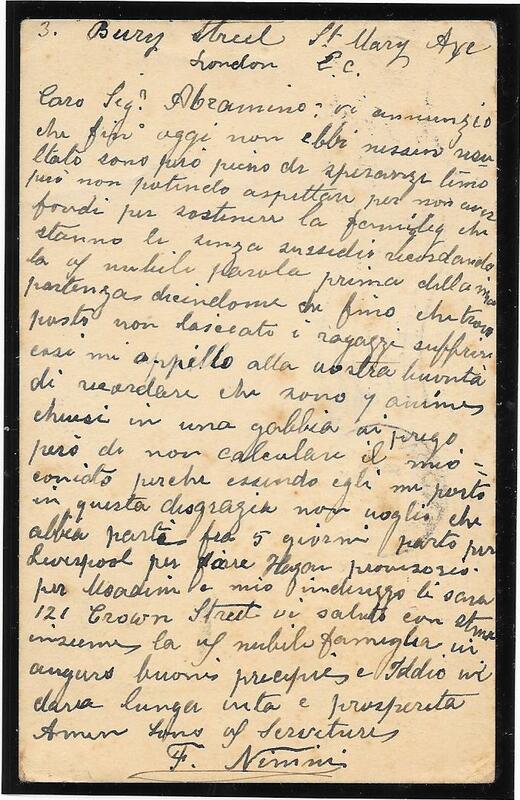 from October 5th 1897 to November 26th 1897. The example offered here, used on October 7th 1897, is hence one of the earliest known. 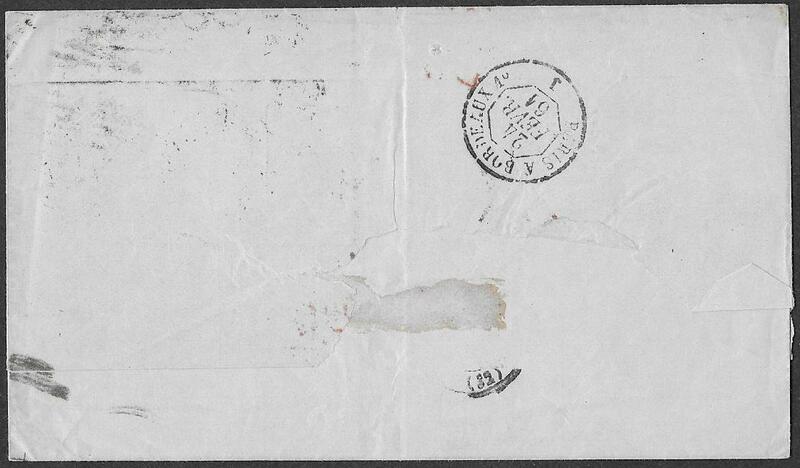 NB: the envelope is in better condition than the scan suggests. Latest known usage: Bickerdike Trial Machine. 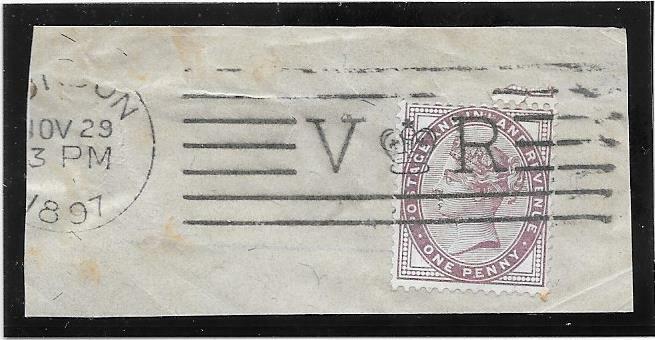 the Die 2 seriffed letterings of V and R.
which is the LATEST KNOWN usage of this rare cancellation. 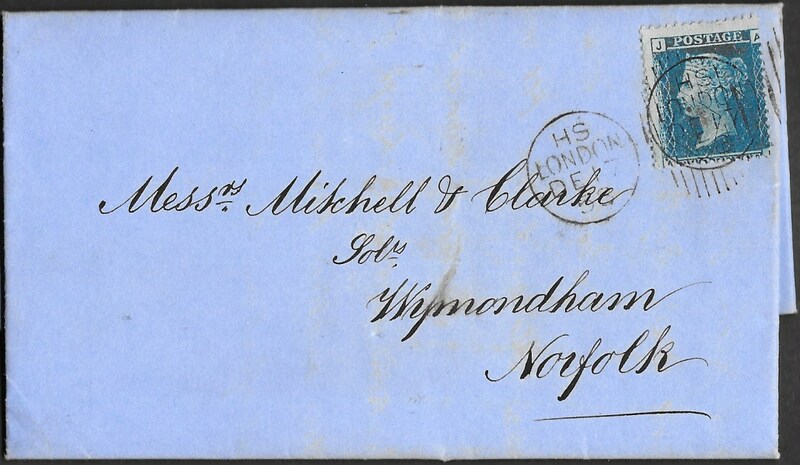 on a clean 1d pink embossed envelope, opened at the bottom, to Ashford, Kent, September 20th 1898. The previously recorded dates of usage for this machine are August 27th 1898 to September 30th 1898. This example has the dater die variety with the star point pointing upwards. On the reverse is an Ashford Station Office cds for September 21st 1898. 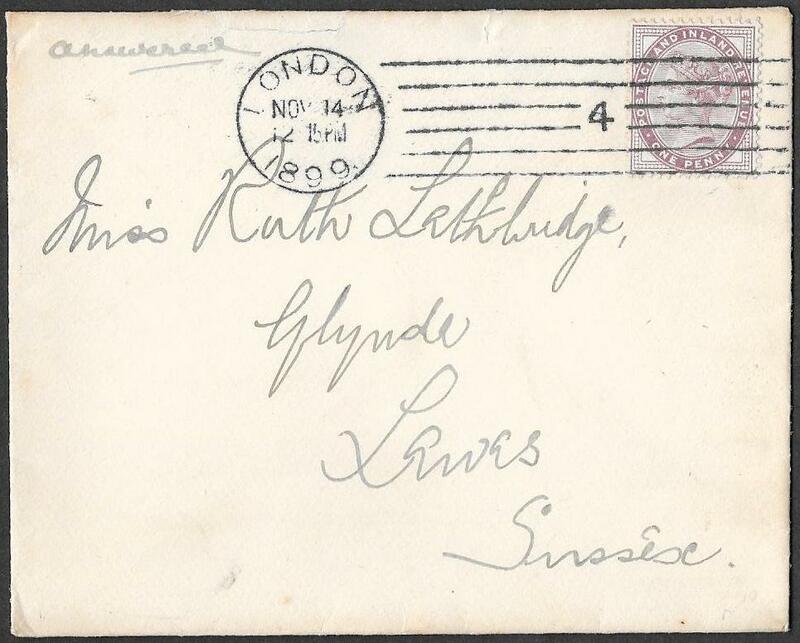 Only 12 covers and cards are known with this trial cancellation and hence a very rare item. 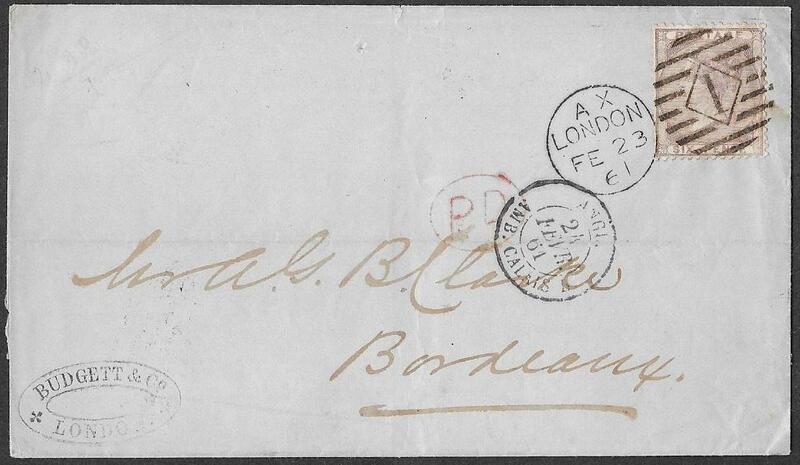 NB: a few small age marks at the bottom of the envelope but the browning is a trick of the scanner. There is a thin straight line indentation above the dater which appears to have been made by the machine. 151528. 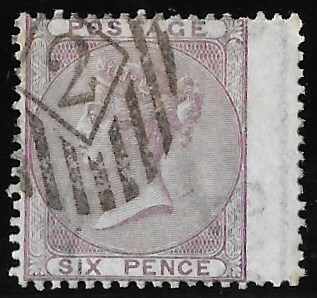 Piece with a fine strike of the Boston Trial Machine on a 1d lilac. this dater die variety has the star point pointing downwards. Dated August 26th 1898 this is the Earliest Known usage. NB: the browning to the right of the 1d lilac is not as pronounced as in the scan. Boston Trial Machine: a very early usage. 151529. A neat and clean piece with an exceptional strike of this trial machine tieing a 1d lilac. This dater die has the star point pointing downwards. Dated August 29th 1898, it is only three days after the EKD. NB: the browning at the left is a trick of the scanner. Boston Trial Machine: used to an overseas destination. with the dater die star point pointing downwards. 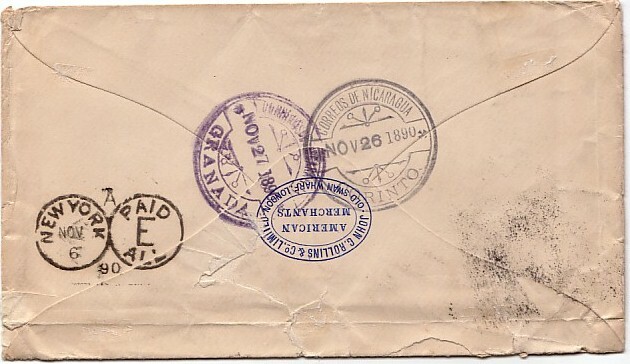 Only 12 examples are known of this Trial Cancellation on a cover or card. 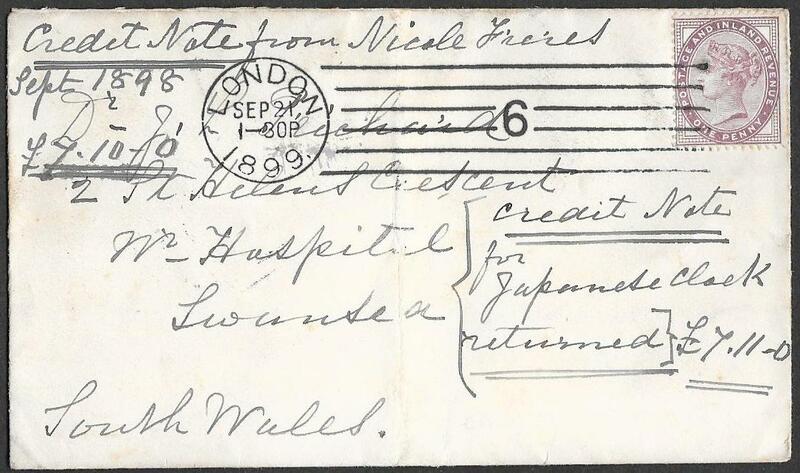 This is the only known example on a postcard to an overseas destination. Extremely rare and probably a unique usage. than the scan as are the few age marks. 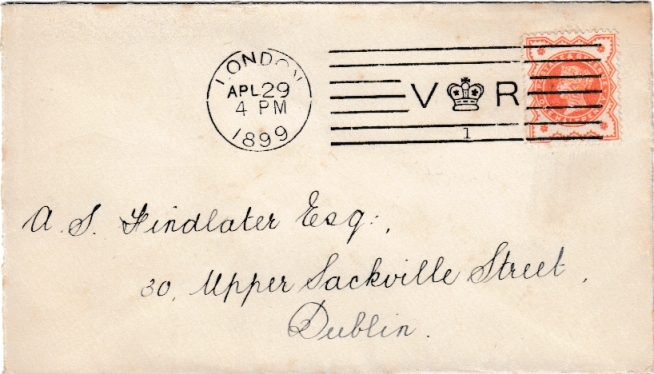 with 1/2d SG197 addressed to Dublin, no postal markings on reverse. as a consequence of early trials in October 1897: see Item 151289. The example offered here is the earliest we have seen and the finest. NB; the browning is a trick of the scanner. 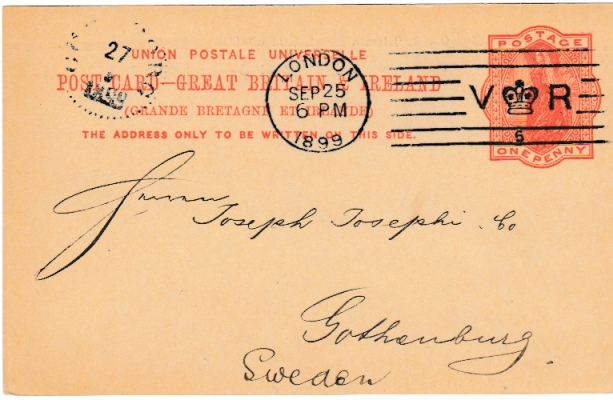 an exceptional strike on a superb UPU One Penny postcard to Sweden for September 25th 1899. Superb item and very hard to find in this condition. 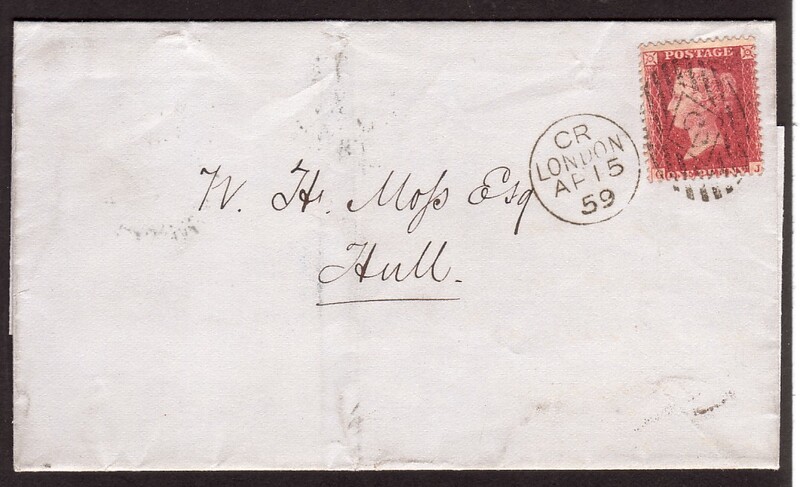 to Sunderland by the Pearson Hill no.2 duplex, April 12th 1861, leaving a clear QV profile. caused by a scratch on the printing plate. Last Day usage: Cresswell Machine. – the LAST DAY of usage of the Cresswell machine duplexes; Code 8Mg is also unrecorded. A rare type and the only example we have seen used on this date. 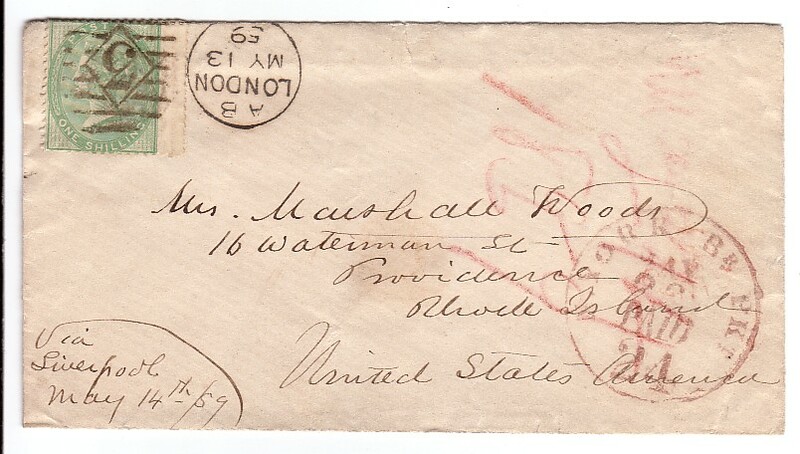 machine cancellation, December 10th 1884. 15130. 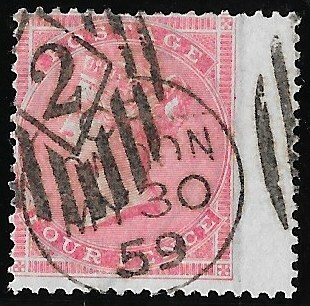 1887: 2 1/2d, SG201. 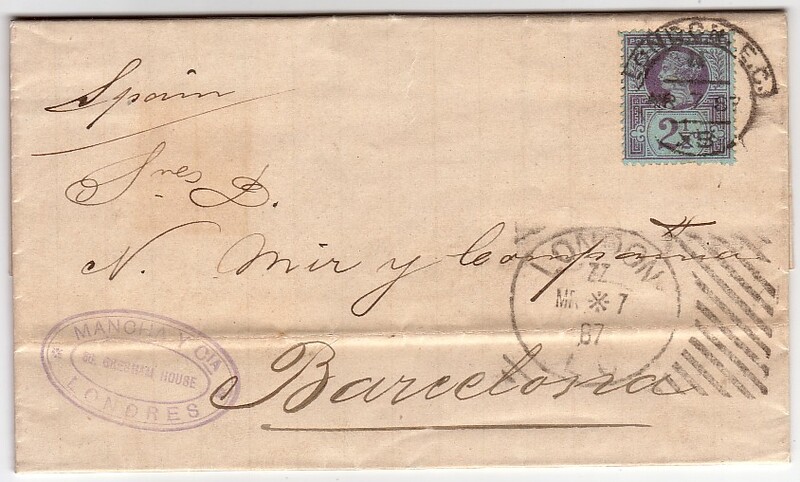 Entire to Barcelona, tied by a hooded circle date stamp, March 7th 1887. The Hoster machine cancelled the item of mail well away from the stamp itself. 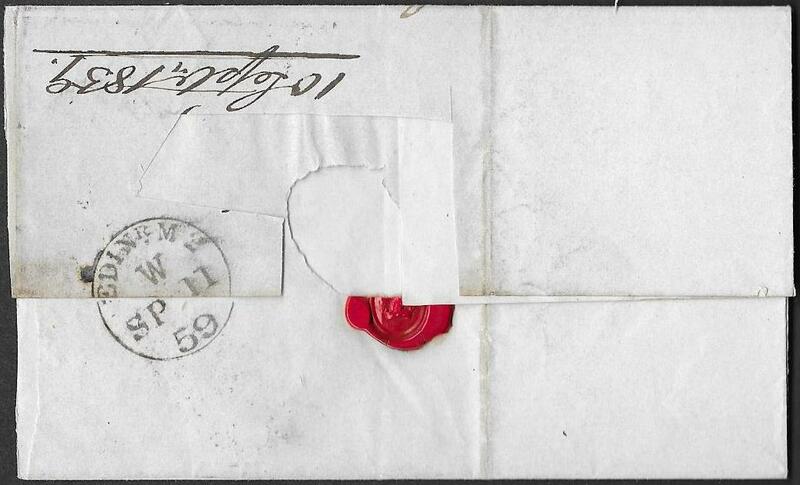 Hence a complete and very fine strike of Type 111 for March 7th 1887, was the result of this missed franking. the later printings were on the more common blue paper. Scarce combination of features. Nicaragua with the appropriate transit markings clearly struck on the reverse. 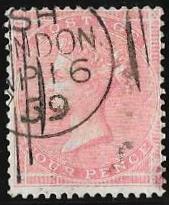 A rare combination of stamp, cancellation and destination. BICKERDIKE machine for May 8th 1899 and within the first two weeks of usage. Superb item and rare so fine. 15133. 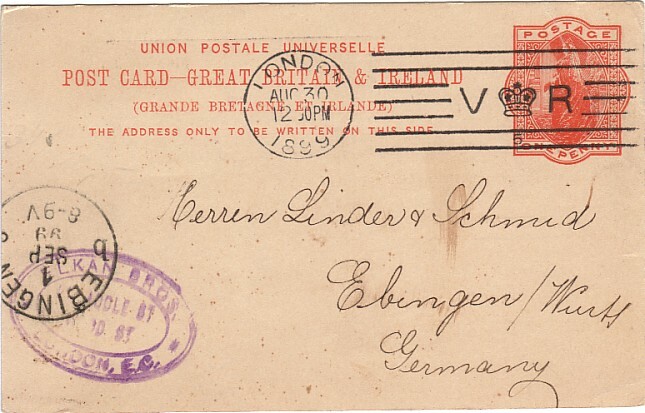 Clean 1d UPU postcard, corner crease, to Germany: superb strike of the Number 5 BICKERDIKE machine, August 30th 1899. 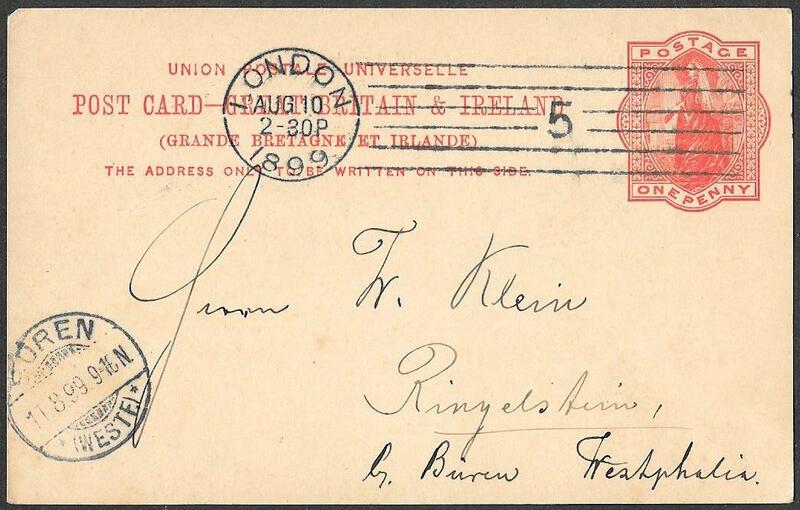 Message written in German and a scarce usage on this type of card.